I got to the end of 2017 carrying a bunch of assorted questions. I gradually managed to sort out answers for all the little practical questions like ‘What to get my brother-in-law for Christmas?’ and ‘How many summer dresses will fit into my bag for the drive north?’. Some questions had to sit unanswered till the new year, such as how to tidy my office. The rest got packed away, and we embarked on road trip and Christmas family parties and trips to the beach, with no room for questions other than how much I could/should eat/drink. Besides, I was just too tired for questions. But now I’ve had some good ‘stop’ days I find a few questions poking their head around the corner again. I ordered a pile of books from Hewitson Library about leadership, though I’m not sure that quite counts as holiday reading! But I live in hope that I’ll emerge from exhaustion into some creative thinking space before work begins in earnest for 2018. The name of the Lord is a strong and mighty tower. The name of the Lord is a refuge for my soul. The name of the Lord is a pillar I can lean on. The righteous run into the name of the Lord. There’s something about sitting under a tree. Very biblical I’m sure. Good mental recovery space for me. Me and God and tree. This scruffy pine on Boxing Day talked to me about finding shelter. You have to go looking for it. Shelter when you need it is provided, but it takes some effort to get to it. Intimacy with God doesn’t just fall on you, not often. We have to “run into” it. This summertime I seek the living God. I’m a bit worn out, and I don’t feel much like praying. But I know that Christ is waiting for me. I believe in his open arms held out for me, though I cannot see them. I can see pine needles and hear the swish of foam on the sand and the call of seagulls. I can feel the damp under my bum and drops dripping on my head. It’s a kind of annointing I guess. “To integrate our spiritual life and our leadership means to adopt a mind-set and “heart-set” that are congruent with the good news of the Christian faith. We will rejoice in the unmerited grace of God for ourselves as sinners, rest in the sufficiency of Christ’s work for our standing with God, and rely on the work of the Holy Spirit for fruitfulness in ministry. In other words, our leadership will be built on a solid foundation of God’s work in our life; we will be freed from thinking that we have to achieve sufficient results, please the right people, or gain power in a certain sphere of influence to feel good about ourselves. The less we feel the need to strive and strain to prove to others or to ourselves that we are lovable, valuable people, the more we will be free to serve Christ’s purposes in our leadership. Instead of being slaves to producing results, pleasing people, or expanding our sphere of influence, we can look to the Holy Spirit to work through us to lead the team in the pursuit of God’s agenda. Objective and subjective measures are, to be sure, still relevant for evaluating our effectiveness as leaders; we need to submit to both self-examination and to a process of critique by others if we are to grow professionally; and the degree of power and influence that others grant us may be an indication of our effectiveness. Nevertheless, our starting place for Christian leadership needs to be a well-grounded spiritual life that is conguent with the teaching of the gospel – in head, heart, action, and experience with God. As our spiritual life increasingly becomes the basis and driving force of our leadership, as as we use our Spirit-endowed gifts faithfully, our ministry as leaders will be fruitful – in God’s timing, according to God’s will, and as a result of God’s working in and through us. For 9 years we were amazingly blessed to live beside the Kahuterawa River, in Linton just out of Palmerston North. The Kahuterawa was constantly changing, through droughts and floods and the occasional digger. We saw trees grow or die, tributaries form, waterfalls and swimming holes come and go. When we first arrived the main flow of the stream had cut through a short cut and left the wider bend of the river mostly abandoned. Near to our house was what had once been a lovely deep hole, but with the river changing course it had become reduced to a somewhat slimy pond with only a trickly of water flowing into it. Ministry gets like this, don’t you think? As we work and give and teach year after year there is a tendency towards drying up. Ministers commonly describe feeling more drained than replenished. We keep drawing on the pool of resources and faith that was dug out in us in years gone by, but with a lurking sense of panic that if someone else looked hard enough at us they’d see that we’re no longer really in the flow of the movement of God; they’d spot us as a fraud. That’s why I’m enjoying Timothy Geoffrion’s writing. He calls me back to the possibility of full congruence of heart and work, Gospel and daily living. Why would we who lead in Christ’s church not be experiencing for ourselves the very grace and favour that we preach and promise others?? Why not be at peace with ourselves and our God and our calling? A couple of years later the Kahuterawa River had re-routed itself (after a dooser of a flood!) and again the corner near our house was a fabulous swimming hold. The clear sweet water gushed over the rocks which had once blocked off the corner. Kids again jumped off the rocks with great delight. So it’s an interesting question, ha. How do we get in the flow of the Spirit, in our work and in our own living? Maybe it’s not up to us at all, after all the Spirit blows where it will (John 3:8). God’s power is not under our control. But I do believe that we are responsible of the structure of our lives. Like the rocks, mud and weeds of the river bed we can channel God’s Spirit, open up to it or block it. If we want to operate in the flow of God, and I really really do want this, it’s up to us to clear the way. If you’re hoping for a closer more integrated relationship with God, I figure that a helpful place to start is to assume that God wants that even than you do. Let’s assume for a moment that God is always reaching out to us, trying all sorts of ways to get our attention. We get a bit stuck in our own search for God, but I figure that it’s far more helpful to spot the ways that God is searching for us. I was thinking about this under another scruffy pine tree on another beach; this time in Porangahau, a wild open space of Pacific ocean and sand as far as the eye can see. I perched myself on a low pine branch and looked around. My eye was caught by a small spider web woven in the cone-shaped space in the top of a pine branch. Last night’s raindrops sparkled on each woven thread. It was utterly astonishingly lovely. The answer to my question was obvious: exquisite beauty. God is making incredibly beautiful things, in every corner of the universe in every second of every moment. Mostly we humans fail to pay the slightest bit of notice. Get Pete talking about beauty, art and faith and you just sit enthralled, lapping up his quirky and inspiring insights. He is a passionate advocate for art in worship and creativity in social action. It starts from the beauty and boundless creativity of God. It’s all well and good to notice beauty in our environment. It sounds sweet and obvious, ‘take time to smell the roses’ and all that. But I notice myself noticing something beautiful and giving it my attention for about 1 second, maybe 5 if it’s totally stunning. Then I’m off. That was nice. So what? If God is bothering with the creation of exquitely beauty all around us, how can we connect not just with a flower or a sunset but with the creative force behind that? Probably the answer has to include slowing down. And that’s a big part of what artists teach us, to look more slowly, to respond more slowly. And it’s not just tangible beauty in nature. I’m also talking about beauty in people; a touch, a word, an act, that reveals goodness in a human being. When we get really good at noticing we might even be able to notice beauty in ourselves, without pride or shame or control, just noticing it. I’m pretty sure that God is quite know-able as we meet him in his beauty. After all, no one was better at noticing beauty than that Jesus guy. He’s the one who spotted the sparrows and the lillies and the true nature of each person he met. He’s the one who said “I have food that you don’t have a clue about.” (John 4:32). I figure that a big part of that sustenance he had full access to was his noticing of God at work in everything everywhere. But wait there’s more! What are some other ways in which God is revealing himself to us? Oops perhaps that way of phrasing it has unfortunate associations – we’re not that comfortable with people, especially not older men, revealing themselves, are we?! … how would you describe the process of God’s self-revelation, inviting-communication, initiative-taking, friendship-making? “Have you understood all these things?” Jesus asked. “Yes,” they replied. I’m a teacher of the law. I work with the ancient scriptures and look for ways to bring them alive for people in 2018. I experience this as Spirit-gift, for I find it astonishingly easy. When I read the Bible the words reach out to me (mostly, not always) and rearrange themselves into contemporary phrases. Invisible threads of meaning spring from page to page across the texts. I don’t take much credit for this, it is so obviously the work of the Holy Spirit. It’s my job to bring my best attention to it and craft a handful of it into a good-enough form that others might be able to digest and be fed by. I experience the storeroom as a treasure-house in which I find old things which I can polish up and bring out to share with others. The ‘new treasures’ that Jesus refers to might include the scraps of emotion and photos and memories and questions that I take down from my life and store there, piled up against big words of theology and ancient texts. This sounds to me like Aladdin’s Cave – a vast underground cave piled with infinitely valuable things. The Aladdin movie draws on the ancient Ali Baba story; like Ali Baba I need a process for getting in. He had the magic word “Open Sesame” (once he’d remembered it correctly!). For me the process of entering the storehouse is about being in the right head-space. I can, at a push, whizz in and out when putting together a last minute sermon, grab a usable insight and I’m off. But it’s far better to lay out a smooth mat of quiet attention, rest in prayer a while before stepping down to explore the wisdom of past and present. So, this is part of the answer to the question ‘How do I know God?’; I experience God as a resource, continual re-sourcing, the source of truth. I experience the scriptures of the Old and New Testaments as boundless resource. Psalms, for instance, are treasure boxes that each time you open reveal fresh insights. This image of God does, however, come with a warning. The caves of Aladdin and Ali Baba are dangerous places. There is a price to be paid for access to such treasure. My engagement with scripture, tradition and faith in the service of my teaching ministry is not an intellectual game. It requires all my heart and the depths of my emotion. It can be oddly painful in a way that I don’t understand. For Jesus his journey through ancient wisdom took him into the greatest pain imaginable; his reading of scripture lead him to the cross. “In accordance with the scriptures” was no neat tying up of loose ends for Jesus – he walked a path laid for him long before. Whenever we do the work of opening up the Bible and connecting it with contemporary issues we are in a sense listening in to Jesus on the road to Emmaus on resurrection day. As they walked Jesus opened up to Cleopas & his mate the scriptures and how they point to him and make sense of his suffering. This is the work of a preacher. This is my partnership with Jesus. The message we get from Hollywood, proclaimed as though it were the ultimate good news, is that authentic successful living is found in discovering how to live our lives on our own terms, in our own way. The Christian faith is left rather nervously and apologetically suggesting that maybe God might have some say in the matter. We’re a bit embarrassed about the whole ‘Jesus is Lord’ thing. I tell people that ‘Lord’ is best translated ‘Boss’, and nobody likes the idea really, of having a divine boss, or Lord, or Master. For we are the masters of our own destiny, surely. As I look towards another year in ministry I hear an invitation from God to let him write the script for my life and my work. I quite like this as a metaphor. God as author. Or maybe co-author. I mean, I’m sure I’m quite capable of making up my own script as I go along … but I have my doubts as to whether this will get me to the ending that I desire. It is a decision to let God write the script of my life, in the big things and the little things, for the dramas of the year and the details of each day. We call this ‘surrender’. Jesus called it ‘dying to self’. Jesus had some very particular ideas about what greatness looked like, and suggested some very different roles for his disciples who sought to lead than they had in mind. My own plot is full of my own competence and greatness. But what is God’s version of greatness for me? What are the ‘creative discussions’ between me and God about the script I’m performing? What is God’s vision for the character that I’m playing? How would he describe her? Of course, it’s not just with God that I share the script for my life, but with each person I encounter. This metaphor invites me to see other people not as audience to my life but co-creators … for if my primary commitment is to discern and follow God’s will in everything, this can’t be all about me. I might find it becomes less and less about me. Kia ora my Friend God. I’ve always been intrigued by the contradiction, paradox & ‘zing’ between the ‘passive’ and ‘active’ in living the Christian faith. God’s will is not a monolithic system of control as some religions see it, or a contrary manipulation as other religions see it. God’s will is a dynamic kindly invitation (though not always a walk in the park!). The fact is, my will is not the same as God’s will (though hopefully there’s lots we can agree on!). We do need to consciously hand over editorial control of our lives on a regular basis to Christ, and the start of a new year is a great time to do that. I’d better wrap up my New Year Musings or you’ll get sick of me. I have idly explored several images of God, prompted by various holiday moments. A pine tree at the beach as a metaphor for God as refuge, rest and safety. A flowing stream of God’s power and blessing. Dew-drops on a spider’s web as a glimpse of God’s creativity and beauty. A treasure trove of God’s truth and wisdom and Word. A life-script as a way to understand God’s will and purpose. The point is that God is both always more than we can grasp and that God is always drawing near for us to reach. God has been gently restoring me, ready for whatever this year holds. God has been calling me towards fresh integration and authenticity – big words for being who I am and letting God be God. It seems like a good place to start, anyway. I pray for you moments of rest and deep relaxing when all that troubles you falls away. I pray for moments of belonging, when you know yourself knitted together with other people in bonds of affection. I pray for you for glimpses of truth beyond and truth within, that God will come close to you in whatever way you need, this new year. I pray for spiritual food that sustains you body and soul through each day of 2018, fuel for the journey, and plenty to share. To finish, a pair of birds’ nests. 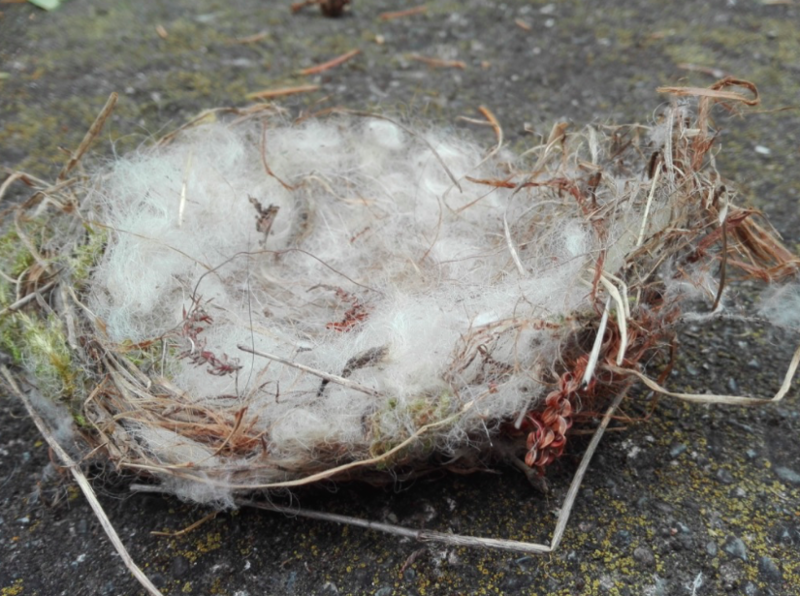 Well, actually one is a real birds’ nest, found at the Glen Innis farm, fallen from a tree having completed its task of nurturing a batch of eggs-into-chicks. The other is my attempt to make one myself, a basic imitation. Both are constructed from a frame of long grass and twigs, with a base mat of moss and a so-soft bed of sheep wool. 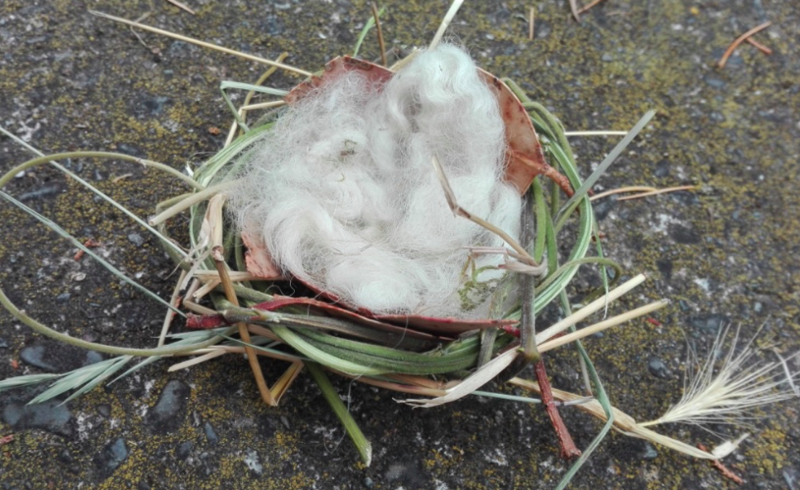 The birds did a superb job of felting it all together into a perfect home. Mine is far more scruffy. I found it astonishingly difficult to get it to hold together; mine would disintegrate in a breeze. To be honest I’m not at all clear about the metaphor, make from it what you will. For me this set of musings has been about the structure and the stuffing of my life, what I’m really made of, and God’s role in that. I pray that God will keep on making and remaking me, strong and soft, as only God can do.